The farrowing pen is the most important pen on any pig farm. In addition to reducing the risk of trampling and overlying, it can be built to satisfy pig temperature requirements. The farrowing pen significantly reduces pig mortality, while providing a cool environment for sows as well as a dry, warm environment for the piglets. Below we discuss how to lay out and build a proper farrowing pen. The farrowing pen is the safest environment for both sows and piglets. With the use of pig heating pads, pens provide a dry and warm environment for piglets. 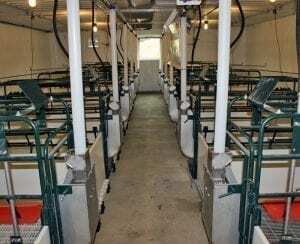 They also provide a cool environment, necessary for the sows. The design of your farrowing pen should support a complete management system to be managed with a thorough cleaning, drying, and disinfection of pens between groups. This prevents infection build-up and drastically reduces the exposure of bacteria and viruses. The rooms should be adequately insulated and utilize heating pads instead of lamps. Needless to say, adequate insulation is especially important in cold temperatures. Our recommendation is to build an actual farrowing house containing five to six farrowing pens, although the number of pens will be determined by the number of sows on the farm. The pen house should be between 43 and 50 feet long and about 13 feet wide. Each pen should be about 6 feet long, 6 feet wide, with a 2 ½ foot wide feed passage on the front side of the pens. The farrowing houses should be size appropriate to the number of sows in the herd and the number of births planned for each week. For a smaller farm, 6 crates are appropriate. Each pen should contain a farrowing crate where the sow is kept from one week before birth through 35 days after birth for sufficient weaning. The crates should be placed in the pen with allowance of 2 ½ feet on one side, and one foot on the other. 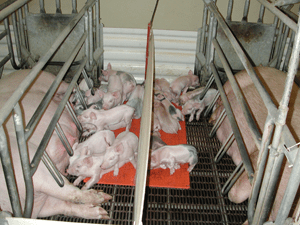 Since creep feeding is important to optimal pig growth, a creep area will be necessary for the piglets. Generally, creep areas are two feet wide to accommodate both heat mats and large litters. The creep area will help in preventing deaths by result of crushing. There should be passages in front and behind the pens for easy access to the piglets without having to climb from one pen to the other. The farrowing house requires adequate ventilation to properly cool and ventilate the house. Keep the temperature no higher than 70 degrees Fahrenheit, for maximum sow comfort. A livestock ventilation system is necessary to both keep the housing area cool (without drafts) and air quality good. The design and build of your farrowing pens and crates are crucial to the livelihood of your sows and piglets. Farrowing pens are proven to help reduce mortality rate and keep your pigs in a thriving environment until it’s time to join the rest of the herd on the farm. With over 40 years of experience, we at Osborne Industries know what makes a successful hog facility! If you’re looking to optimize your production process, contact us today to speak with one of our experts about how we can help.